Emergency Radios are important Emergency preparedness is on the top of our minds lately, especially in the aftermath of the latest Hurricanes, wildfires and mudslides. When a natural disaster strikes, emergency radios can offer multi-use solutions during power outages. We’ve reviewed the best emergency radios to ensure you will be prepared during severe weather or another catastrophic event. This is the weather radio I personally own. The Midland ER310 is equipped with a high capacity lithium-ion battery. The battery will hold a charge for up to 32 hours. Emergency Weather Radio USB port??? During a natural disaster, you may find yourself without power for an extended period of time. To power up the ER310, all you need is one hour of bright sunlight. The solar panel will allow you to operate the radio for up to 45 minutes on that solar charge. Another power option is AA batteries. The ER310 requires six, which are not included. You can also charge it in a USB port. The antenna works well, picking up the majority of AM, FM, and NOAA signals. Midland emergency radios offer an exceptionally bright 130 Lumen Cree LED flashlight. The high setting provides maximum brightness, but you can switch to low to conserve battery life. The flashlight also acts as a beacon. When activated, you can use it to flash an SOS distress signal using Morse code. If you find yourself in an area that is difficult to get to, the ultrasonic dog whistle can alert search and rescue teams to your location. This is an incredible feature we hope you’ll never need, but you’ll be glad it’s available if you do. The Midland ER310 and Midland ER200 are available and rank high on Amazon. The RunningSnail emergency radio is an Amazon #1 best seller for good reason. The sturdy construction assures a long-lasting product that will even survive a few tumbles. The 2.1 x 6.2 x 2.9 in radio is worry-free in matters of maintaining a charge and recharging. With multi-source power capabilities, you’ll always have power, even during power outages. While power is still available, charge your radio with the external USB. When the power goes out, recharge with a built-in solar panel or the hand crank. About one minute of hand cranking provides up to 15 minutes of radio time or 25 minutes of light use. The RunningSnail takes three AAA batteries. Light up dark spaces with the 1W LED flashlight or focus a strong beam with the zoom function. The RunningSnail weather radio has a great ratings on Amazon. *Nickel-metal hydride batteries are rechargeable, making this not only a convenient but cost-effective charging method. The solar panels are designed to tilt to follow the sun’s position in the sky. This allows the photocells to receive maximum absorption of the sun’s rays. The AM/FM/NOAA knob is designed with a PLL crystal control circuit. 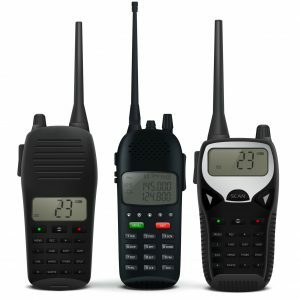 This allows for superior fine-tuning to receive stable reception from emergency channels. The flashlight has a super-bright LED light that can switch to a red flashing emergency signal. This particular Kaito model is available in five different colors: black, blue, green, red, or yellow. The Kaito KA500 has the highest Amazon rating for portable emergency radios. The American Red Cross encourages families to always “Be Red Cross Ready,” and they’re helping you out with this handy portable emergency radio. The American Red Cross FRX3 offers four power sources. So regardless of the emergency, this device will constantly have power. The radio operates with solar power from the built-in panel located in the handle. The hand turbine powers the radio and the rechargeable batteries, which are included. It runs on three AAA batteries. If power is still available, it will receive charge from an electrical outlet via the included USB charger cord. 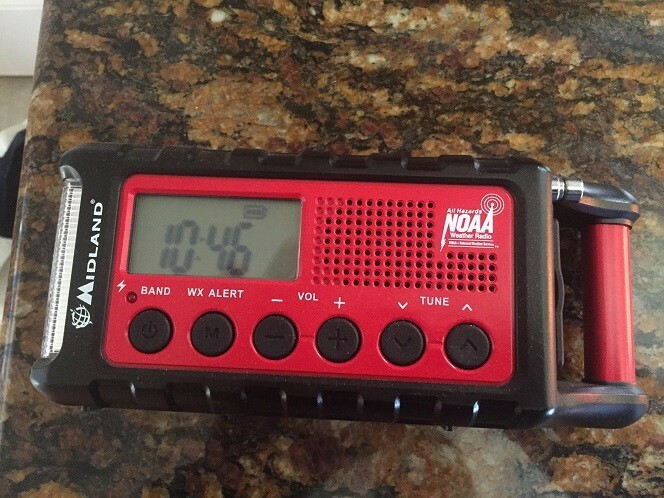 Similar to other emergency radios, the FRX3 signals emergencies such as hurricanes and other severe weather, when the alert function is engaged. The device offers a dump-charge feature that enables a quick, healthy charge to smart devices. An AUX-output allows you to listen to alerts through headphones, or if you need to relax, your own tunes. The American Red Cross FRX3 great Amazon ratings. The Kaito Voyager is another emergency weather radio that offers many power source opportunities. The built-in battery pack features three NiMH rechargeable batteries. The NiMH batteries can be recharged using the dynamo hand crank and the AC adapter, which is included. Solar panels are another option for recharging. The solar panel is a patented design. The flip-up panel adjusts 180-degrees and powers the radio without needing a battery inserted. The back-lit digital display not only provides the date and time but temperature and humidity too. It also has a very convenient station memory program. There is also a two-alarm clock feature complete with snooze. A built-in key lock feature disables the radio keys. This is excellent for preventing battery drain due to accidentally turning on radio features. The top of the LCD screen shows a key symbol when the key lock is engaged. Customer reviews give the Kaito Voyager high marks on Amazon. An emergency radio should be on the top of anyone’s list who is at risk of a power outage due to severe weather. When a radio is your family’s only means of connecting with the outside world, you want a quality one that will do the job it was intended to perform. Don’t wait for an emergency to realize how important it is to have a reliable source of communication and emergency lighting, and a rocket stove. To stay up-to-date on surviving weather threats, as well as helpful tips and advice on rural living, subscribe to our mailing list. And if you’ve ever considered an off-grid lifestyle, check out our DIY solar generator. It’s surprisingly simple and cost-effective!